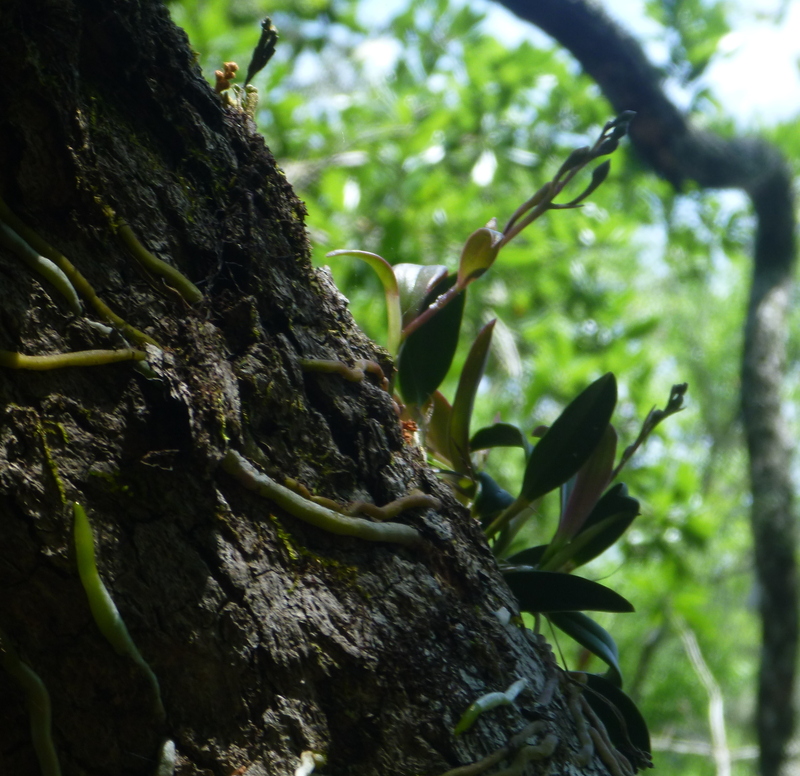 The green fly orchid, is the only north Florida epiphyte which grows on trees. 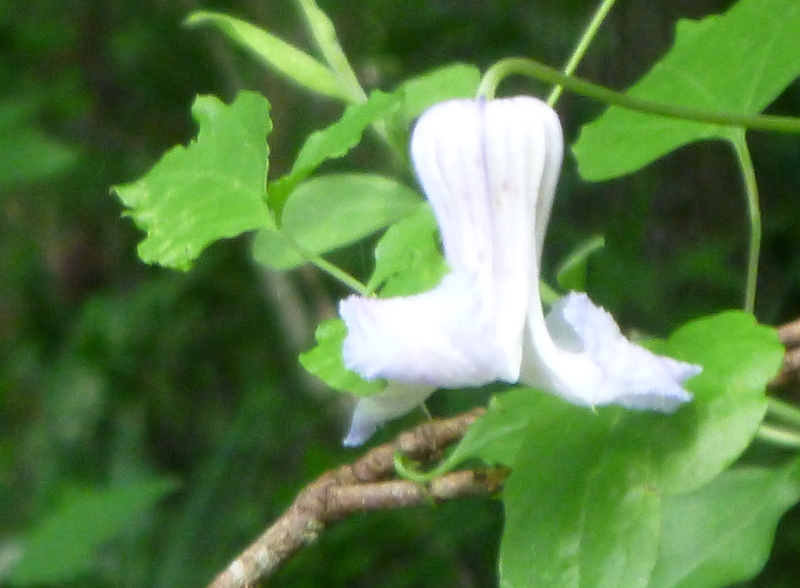 There are several small stands in Womack Creek and also in Deep Creek in Tate’s Hell, but we have never seen it bloom. This year, noticing dried bloom stems, we GPS’ed the locations and checked on it every time we paddled these two areas. Last week we saw the bud stems and today, not on those bud stems which we had flagged, but on another stand, we saw these miniature orchids, not even 1/2 inches from tip to tip of the petals. 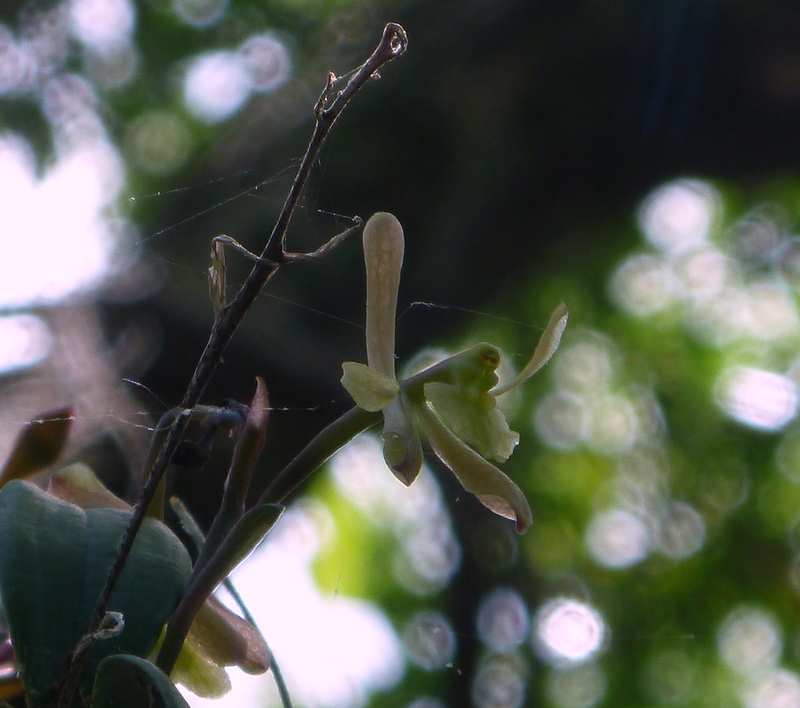 But orchids, they were, and it made our day. 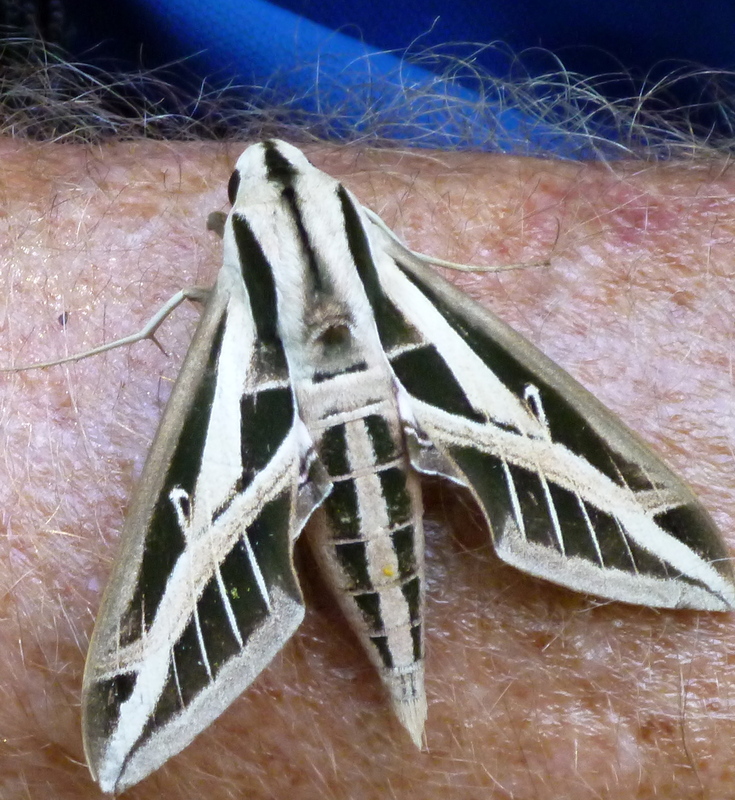 Another memorable sight: a banded sphinx moth, which alighted on Ed’s arm when we were trying to determine whether the rushes were sedges, rushes or grasses. It stayed there for the duration of the photo shoot and would have remained there had we not flung it into the air to fly away. 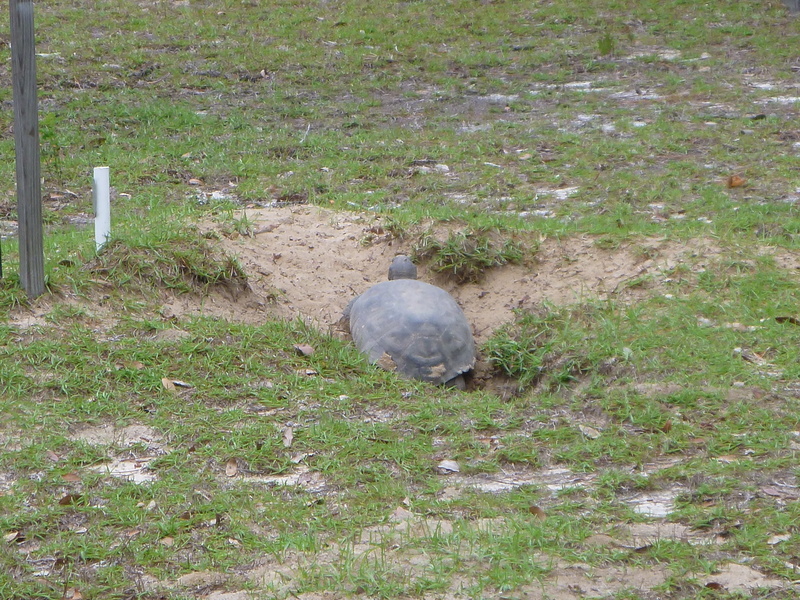 And on a warm day, one can always see a snake or two, and alligators (4) and zillions of turtles. 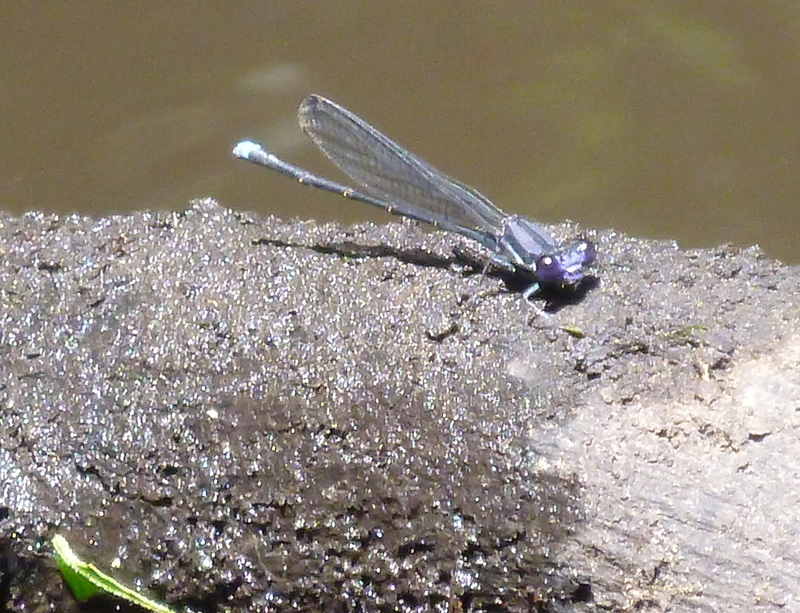 And damsel flies, dragon flies, other insects, including yellow flies — it’s busy on that creek when the weather starts warming up. Not to mention the flowers. 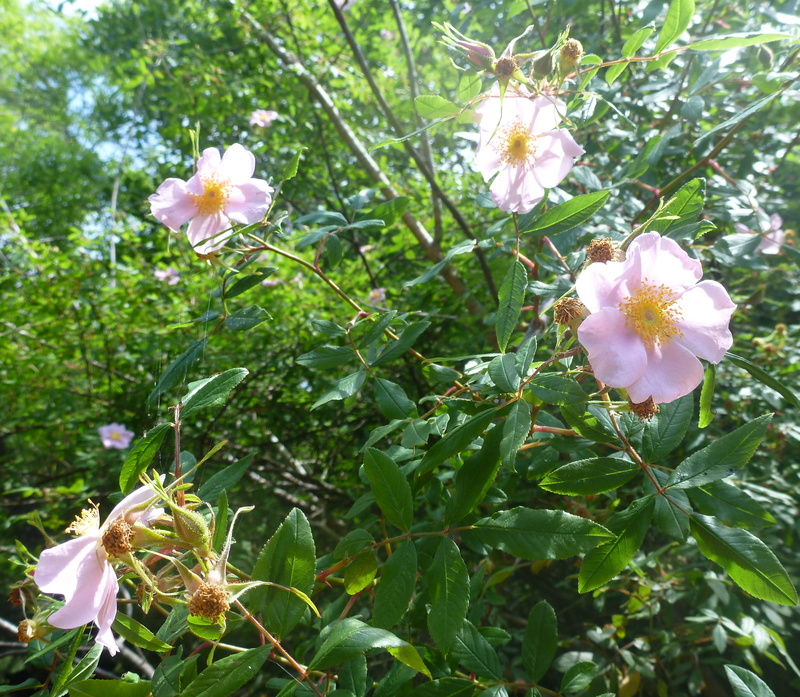 Roses in bloom right now, Dahoon hollies; soon muscadines, large stands of swamp titi and Southern arrowwood. 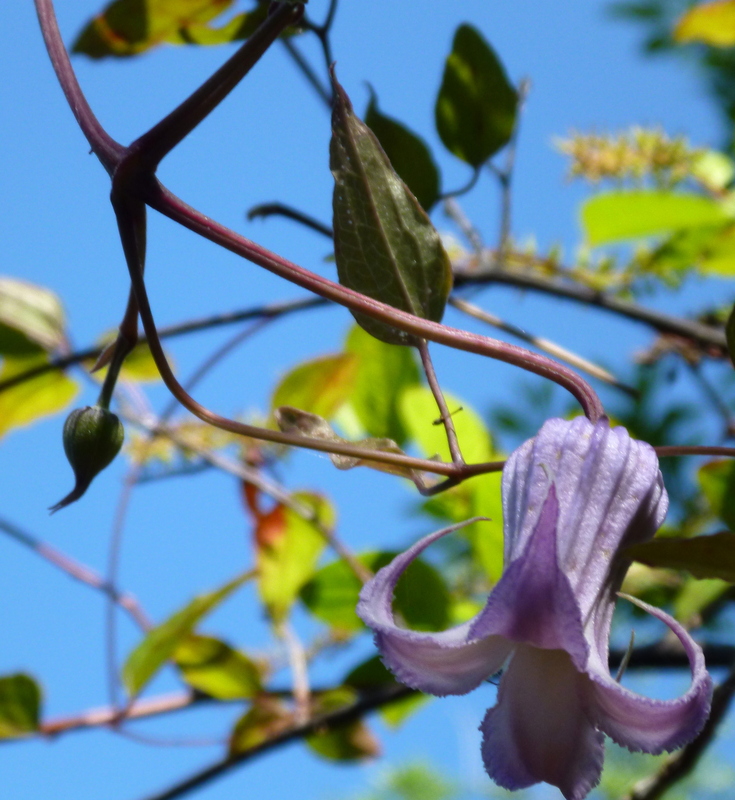 The clematis crispa vines are thriving and this summer one should see a lot of these bell shaped flowers. Swamp titi — just a few in bloom, soon huge stands throughout the creek. Clematis crispa — on vines. Muscadine blossoms, just starting to bloom. 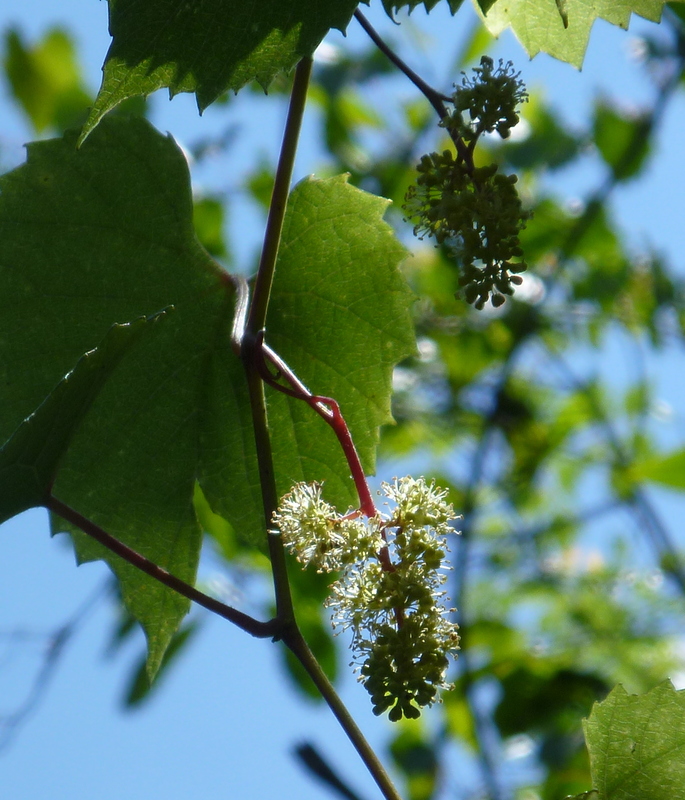 Lots of blooms this year, if pollinated, lots of little muscadines in late September. Stands of Cowcreek spider lily and false dragon head. And the fish were jumping! 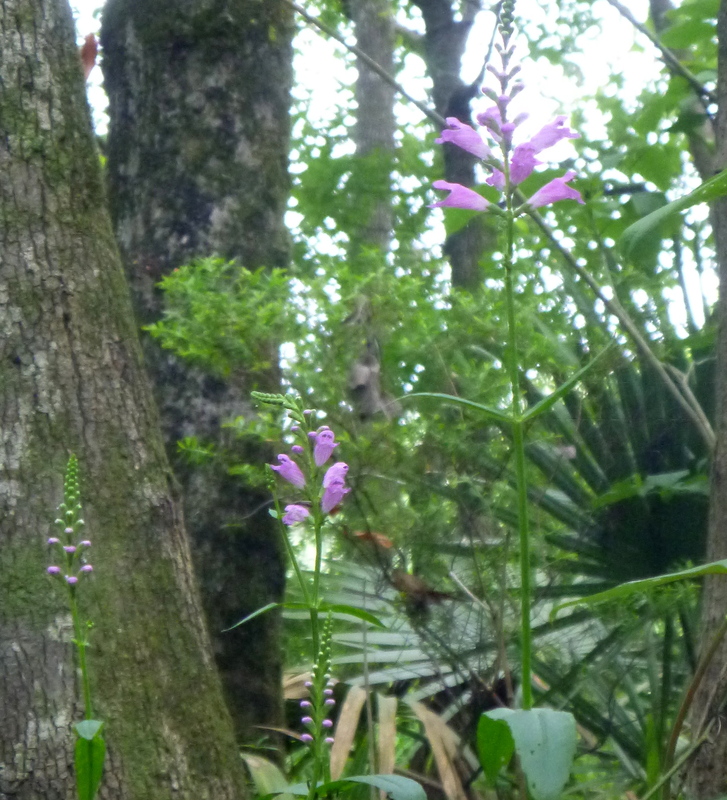 This entry was posted in Insects, Native Wildflowers, Tate's Hell State Forest, Threatened, Womack Creek and tagged Florida native wildflowers, Tate's Hell State Forest, Womack Creek on May 18, 2014 by marylynanded. The day was overcast, the temperature at put-in was 82 F, but there was a slight and welcomed breeze. It felt more like an early summer than late spring day. 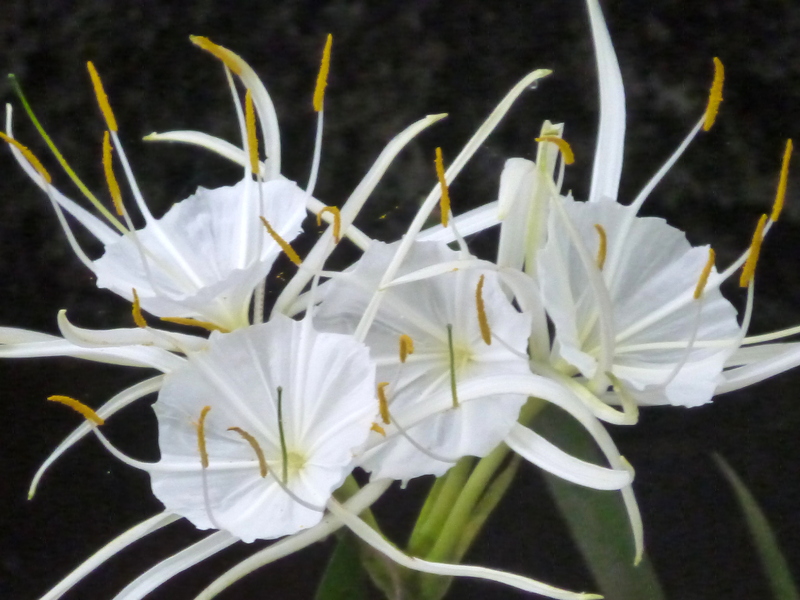 In a little branch off the Ochlockonee before entering Womack Creek, a troupe of Cowcreek Spider lilies — the first of many to present themselves on the creek. 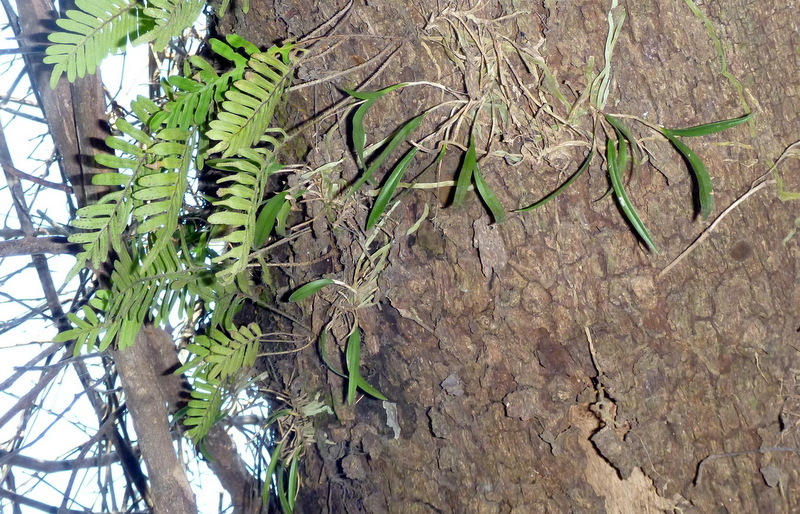 Nearby, in the same branch, more Lizard’s tails than we have ever since in one spot. This is the way it is with the creek — a profusion of one species one year, scarcity the next. Every trip is a surprise and every year is a different scene. Not too far away, and pretty early, false dragonheads. 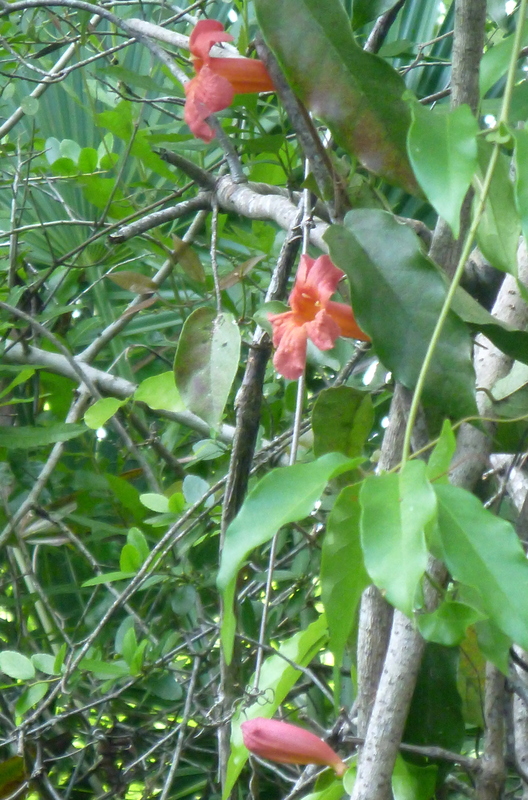 In the main part of the creek in late May and June masses of these blooms were seen last year. Before I left the branch, I could not resist these blueberries — tart with a slight tinge of sweet. There is nothing like wild blueberries — hybrids cannot compare. Last year cross vines bloomed from spring to the killing frost in the winter. The year before they were hard to find. They may not bloom in abundance this year. In 2012 the creek was festooned in clematis crispa. Last year we saw only a few. This year the vines are thick, but the buds do not seem to have appeared yet on these vines. We cherish the few flowers we see. Sweet bays are always blooming; in some years in greater profusion. 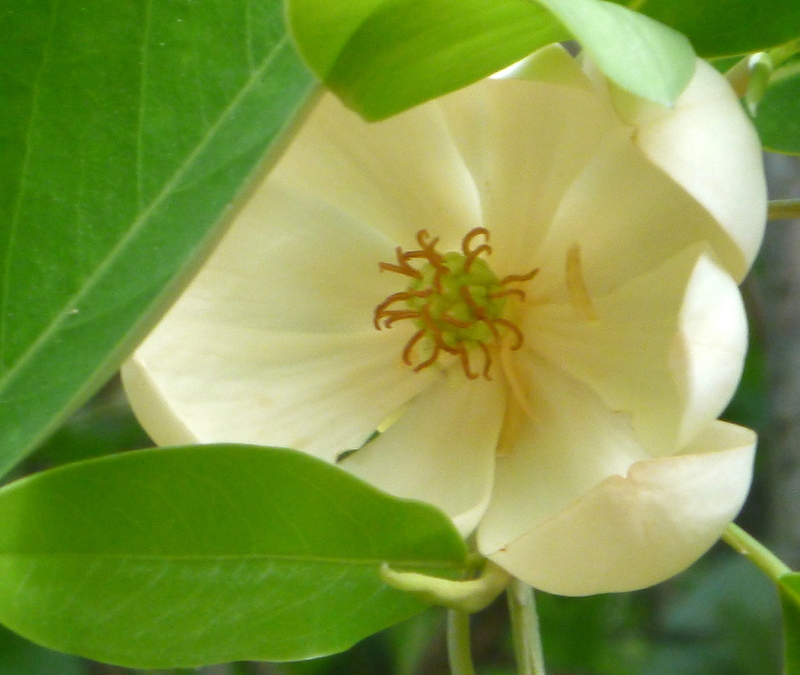 Their fragrance, thick and heavy, lead you to the blooms. 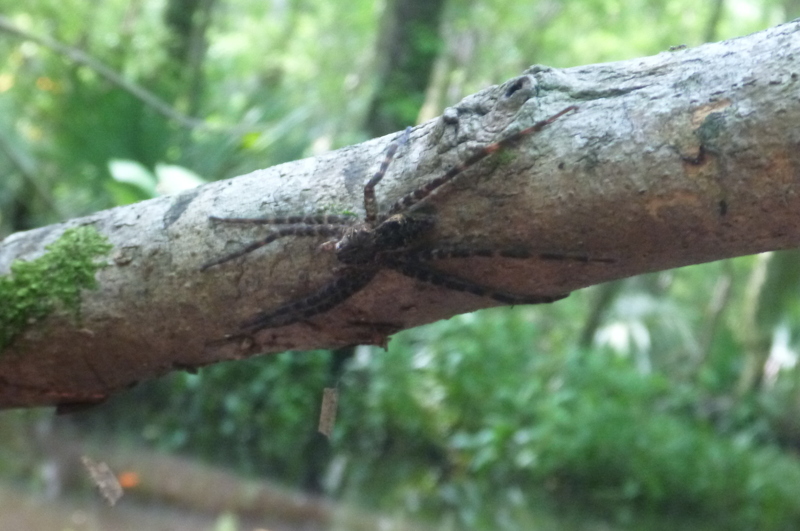 I inadvertently broke this spider’s web while holding on to a branch to get a steady shot. 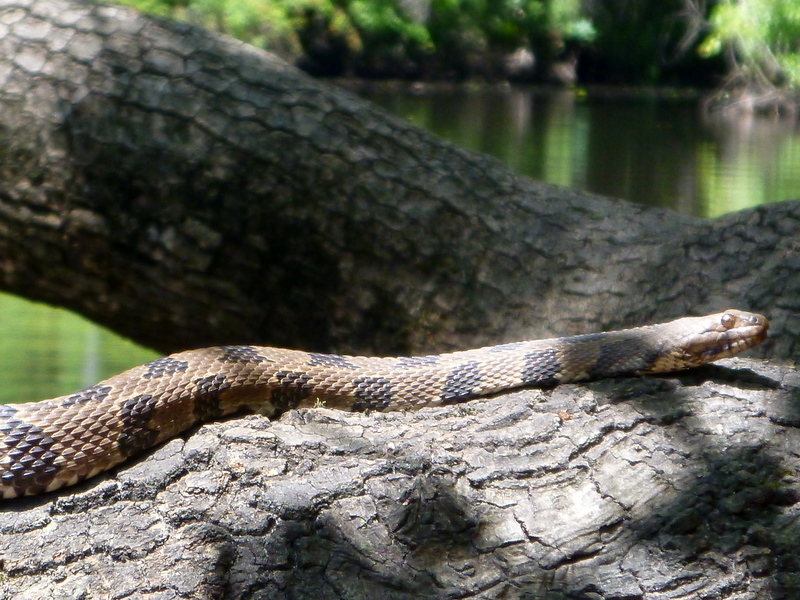 More often than not, it’s harmless water snakes I encounter while taking photos. 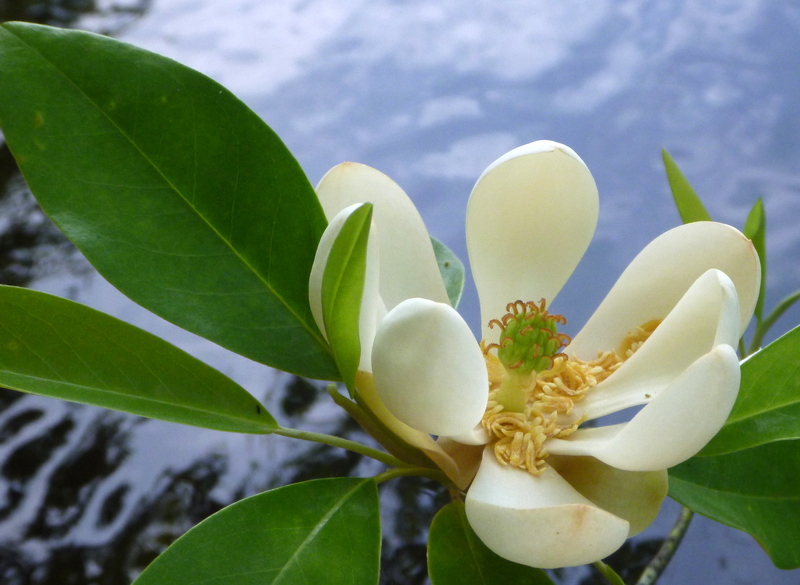 There are three native hollies on Womack Creek: Yaupon, which blooms first, American and Dahoon which bloom about the same time. 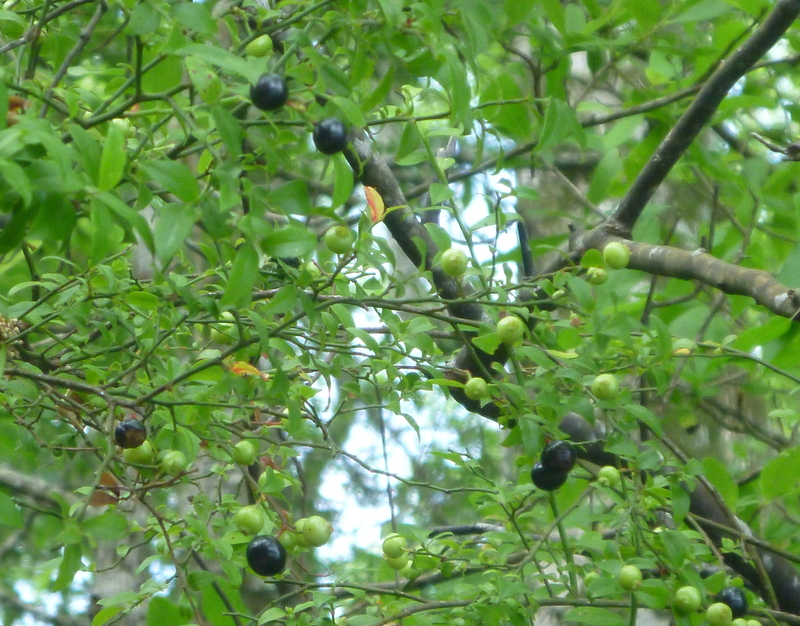 They provide fruit for the migratory birds in the fall. 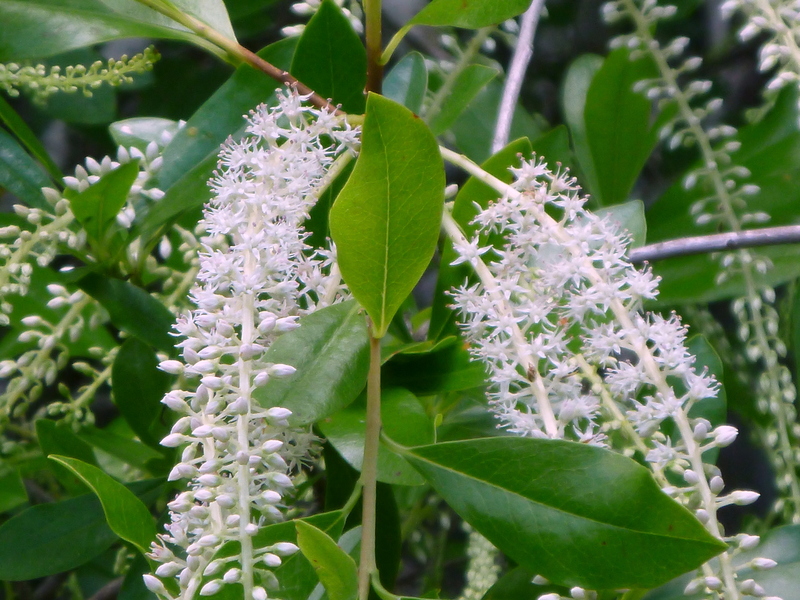 The dahoon hollies will be in full bloom next week. 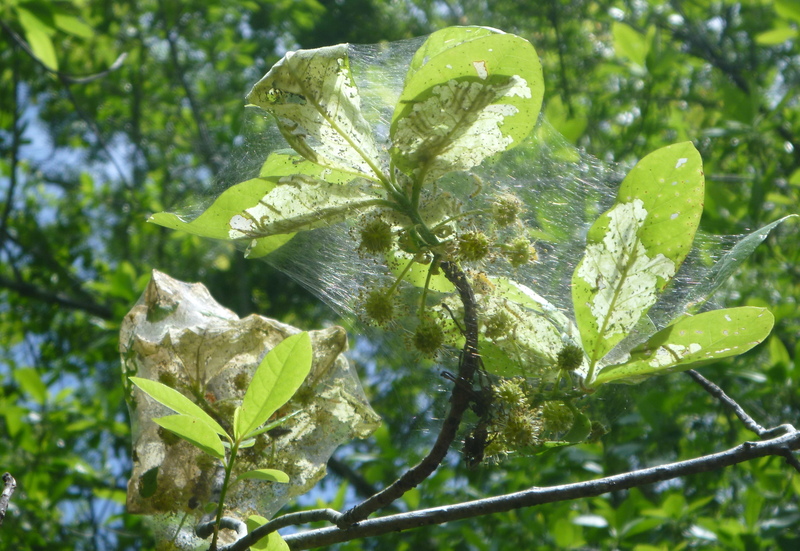 Along with the swamp titi, Arrowwood, muscadine grapes and poison ivy. This inch worm fell on my thigh. I relocated it to a better surface to photograph. 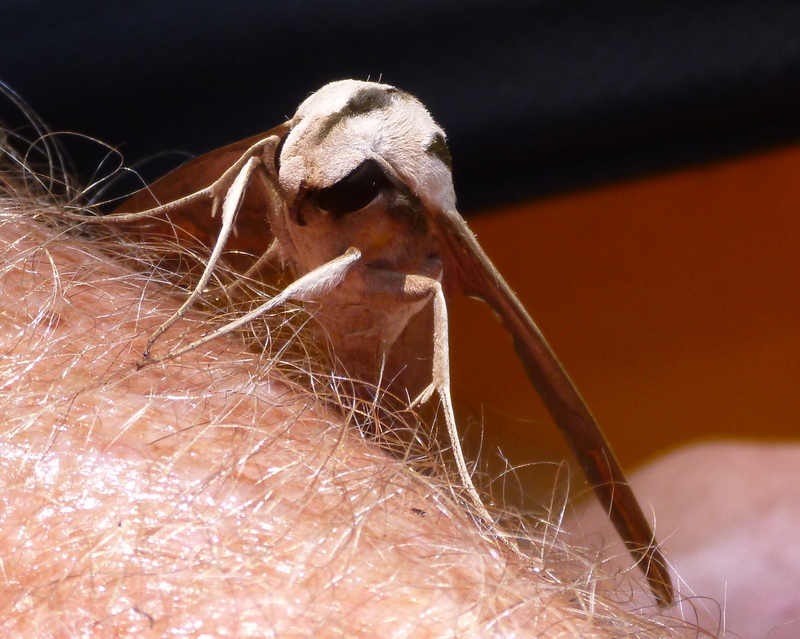 Wondered what type of flying insect it would develop into and where it came from. Got my answer just a few paddles upstream. On the Ogeche tupelos tent worms. 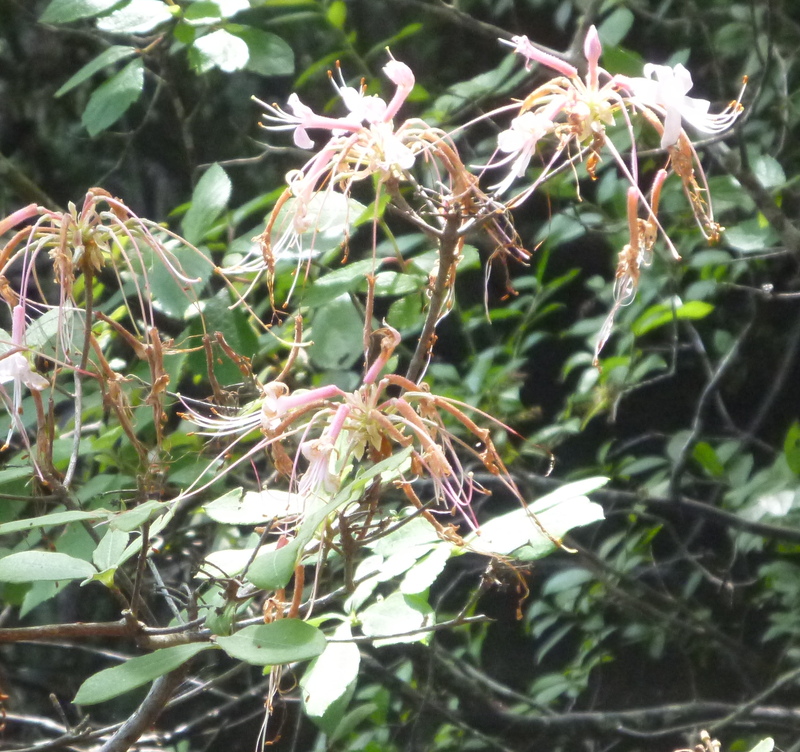 The last of this springs pinxter azaleas — this was a glorious year for pinxters. 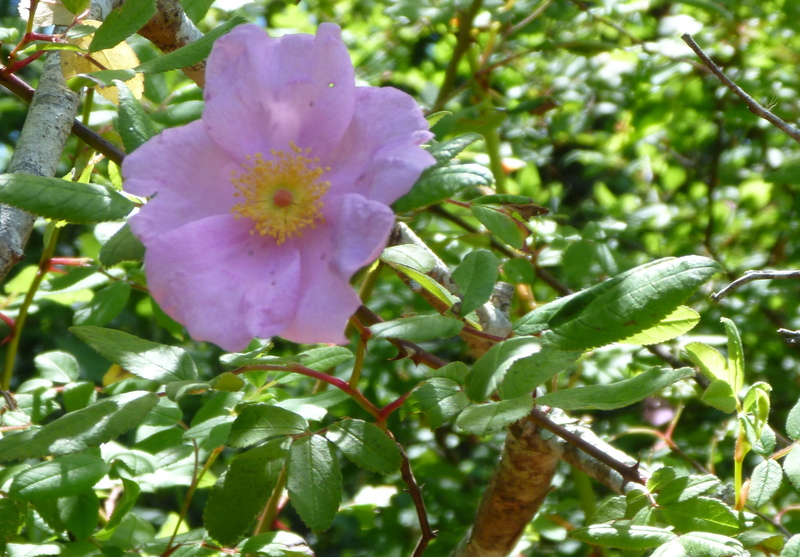 Another flower which leads you to them by scent — swamp rose, not in such profusion as 2012. 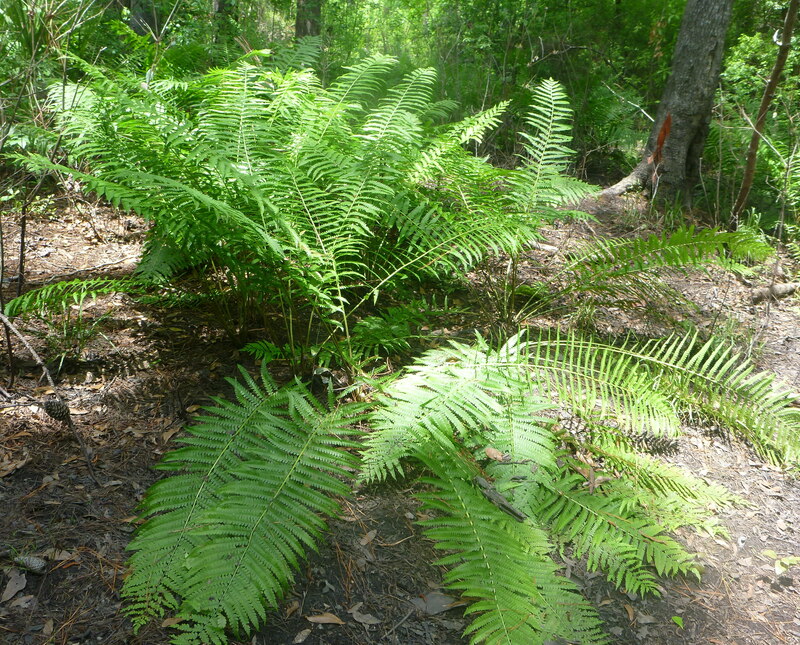 Ferns, a harbinger of summer, at Nick’s Road Primitive Camp Site, our usual lunch stop, 3.8 miles from put-in at the Womack Campground landing. The geometry of natural forms — hard to come up with a better design. 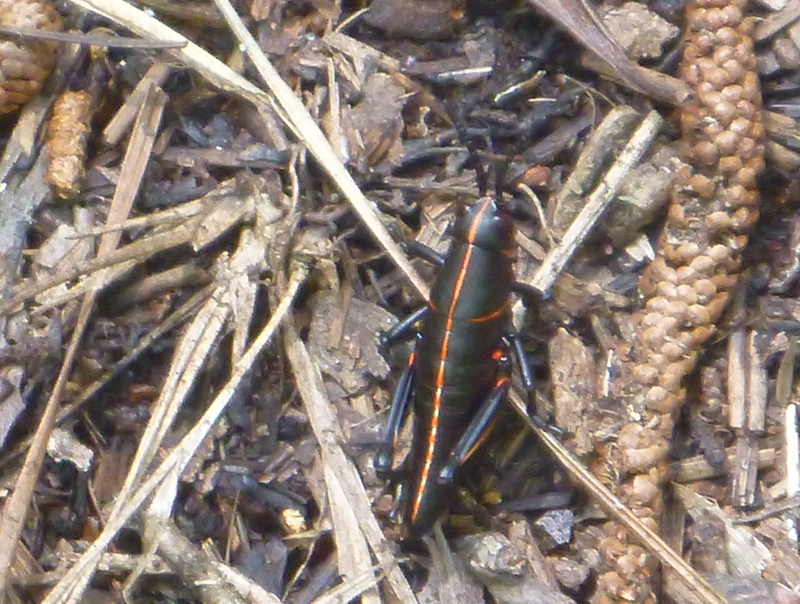 This less than 1/2 inch grasshopper will grow 5 times and consume many times its weight in tender plant leaves. 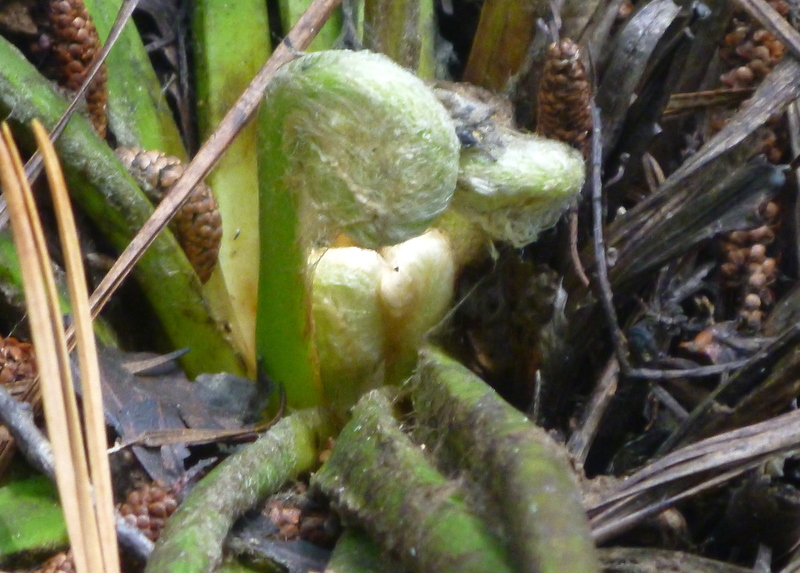 Every trip, we check the green fly orchid plants, a threatened species. 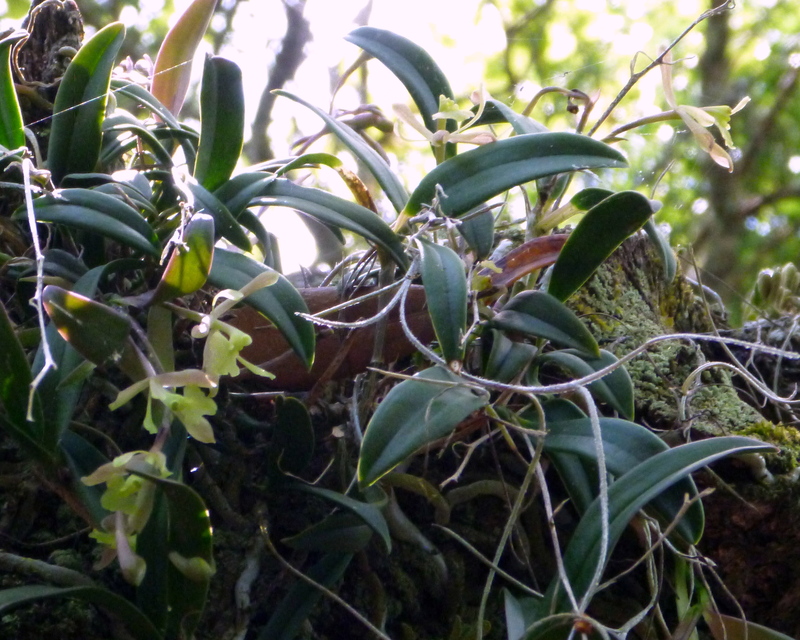 We have never seen the blossoms of this epiphyte, the only tree orchid in North Florida. 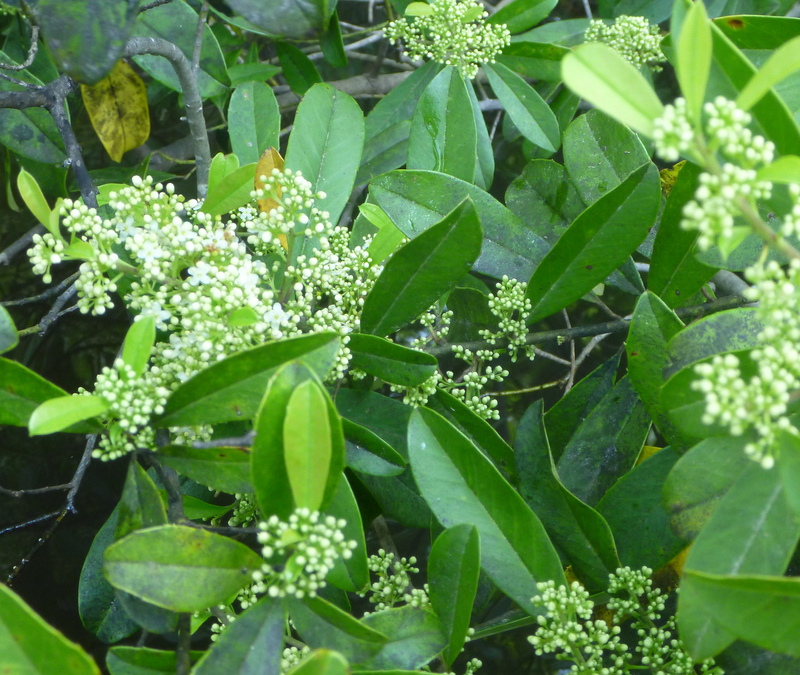 Today we were rewarded when two tiny plants showed these bloom stems — even seeing these buds was a thrill. If you wish to know where they are located e-mail quincypair@comcast.net — we will give you the coordinates. We have been advised not to post the coordinates on a public forum because plant hunters will harvest them. No snakes, today, but we saw a hawk, heard what we believe to be a pileated wood pecker, cardinals and barred owl. We also saw a mother duck with 6 ducklings and a great blue heron — probably feasting on the frogs we heard while paddling upstream. Turtles are always sunning on this creek and the few alligators are skittish, diving into the water with a great splash when they hear us coming. Dragonflies, no butterflies, but mosquitoes and yellow flies at the Womack Creek Campground landing (not at Nick’s Road primitive camp site), lots of bees on the Ogeche tupelos. The old frames in the bee hives on Rock Landing Road have been replaced to store the tupelo nectar which bees transform into honey. As for the sound: 1 small plane, a light drone; one motor boat on the Ocklockonee and a pontoon boat on the Ochlockonee going at minimum speed. 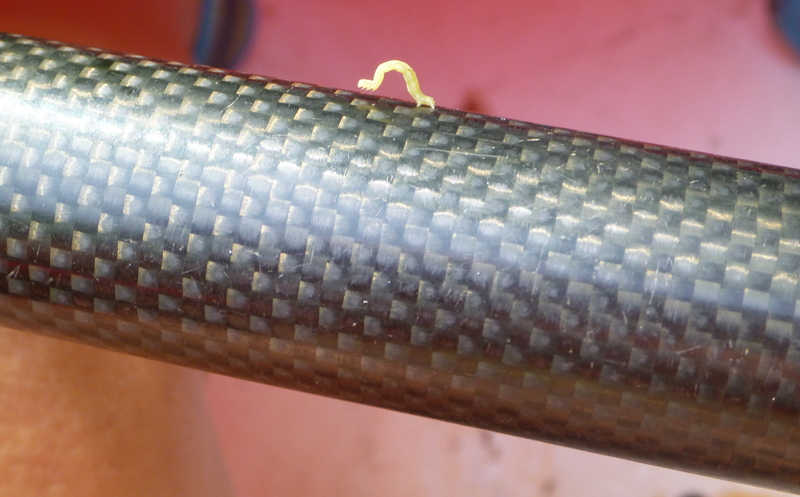 Except for these, the whole paddle was without reminder of human mechanized invention. On Sunday, Mother’s Day, we spent the day with Mother Nature. 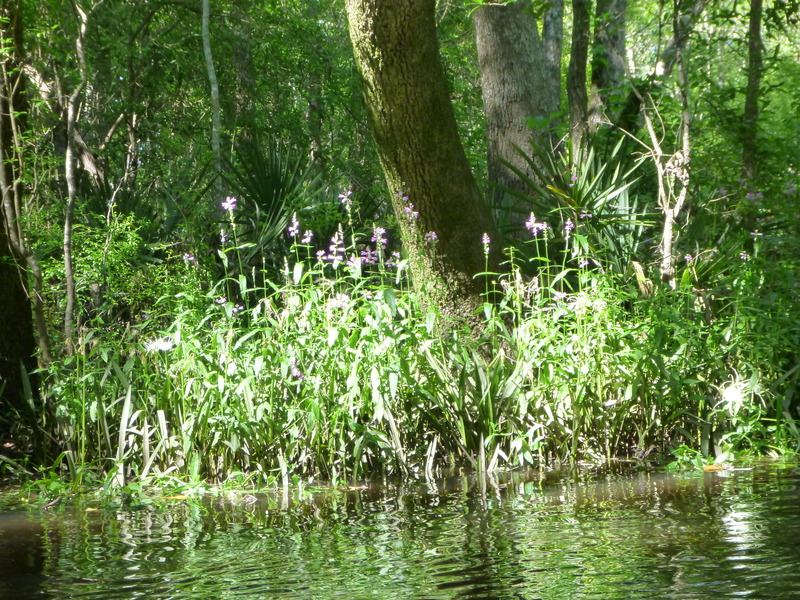 This entry was posted in Birds, Native Wildflowers, Tate's Hell State Forest, Tate's Hell wildflowers, Threatened, Womack Creek and tagged Animals Tate's Hell, Florida native wildflowers, Paddling Tate's Hell State Forest, Tate's Hell State Forest, Womack Creek on May 11, 2014 by marylynanded. This entry was posted in Tate's Hell State Forest, Threatened and tagged Tate's Hell State Forest on March 31, 2014 by marylynanded. 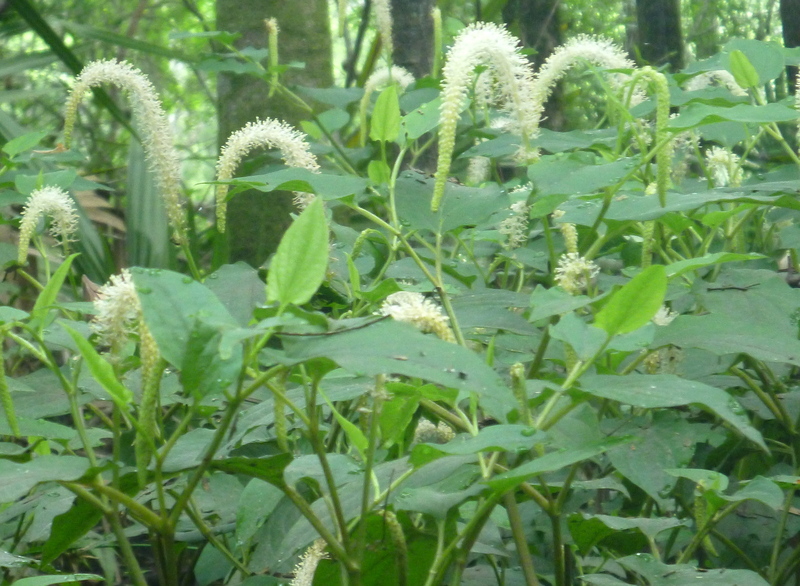 This entry was posted in Native Wildflowers, Tate's Hell State Forest, Tate's Hell wildflowers, Threatened, Womack Creek on December 11, 2013 by marylynanded. This is available in full at http://www.dep.state.fl.us/lands/AcqHistory.htm. Authors James A Farr and O Greg Brock are with the Florida Division of State Lands. Florida continues to lead the nation in purchasing property to protect natural resources and provide resource-based recreation. Our programs have been successful for many reasons, the most important of which is the enthusiastic support, even demands, of our citizenry, who do not have to live in Florida for very long to notice treasured areas being lost to development at the alarming rate of 165,000 acres each year (an average of 453 acres daily) and who are keenly aware of the need to preserve our natural areas to provide a basis for our tourism-based economy. Our political leaders have recognized the popularity of natural resource protection and have responded with a series of land conservation programs spanning more than four decades. funding for our programs has been based primarily on activities that have resulted in the need for conservation: documentary stamp taxes on real estate transactions, which are becoming increasingly numerous as development continues, and severance taxes on environmentally damaging mineral extraction activities. Our programs invite public participation throughout the process, beginning with the ability of anyone to submit an application, through the project evaluation and selection process, the development of management plans, and oversight of how the lands are managed. there are public conservation and resource-based recreation lands in each of our 67 counties, with large tracts accessible to all citizens within relatively short distances. Our citizens have clearly been rewarded for their support and participation with a myriad of conservation lands available for their enjoyment. Finally, and most importantly, we have been successful in preserving for posterity a substantial portion of our natural heritage. Our natural lands contain hundreds of listed species, our most imperiled vegetative communities, significant cultural and historical sites, watersheds and water recharge areas. 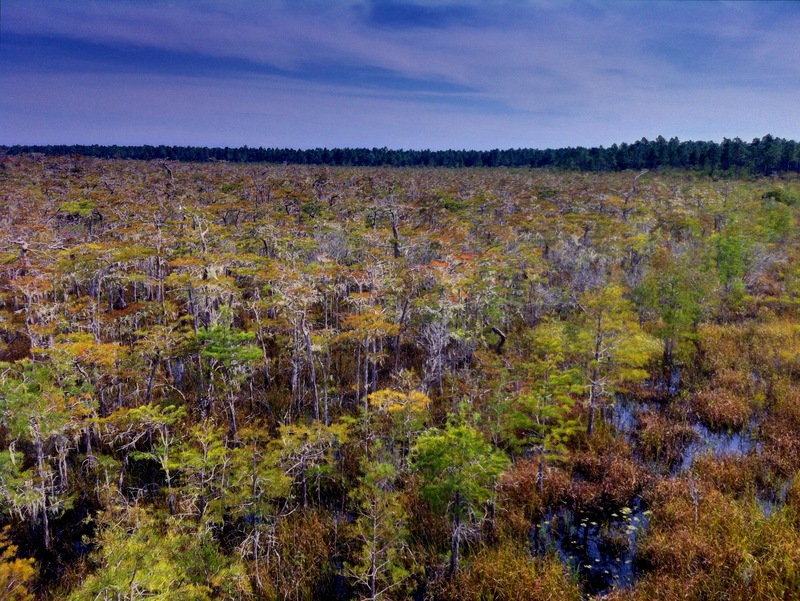 Our lands contain rivers, lakes, springs, beaches, central Florida scrub, north Florida sandhills, significant wetlands, and an incredible variety of upland habitats. They provide us a myriad of recreational opportunities, including nature study, camping, hiking, swimming, canoeing, hunting and fishing. Our 159-unit system of State Parks has twice been awarded the National Recreation and Parks Association’s Gold Medal Award, honoring Florida as the Nation’s “Best State Park Service.” through our environmental land acquisition efforts we are able to embark on restoration of large natural areas like the Florida Everglades and north Florida longleaf pine habitats. Our citizens, their descendents, and our visitors have all gained a heightened quality of life. This entry was posted in Blackwater River State Forest, Endangered species, Tate's Hell State Forest, Threatened and tagged Blackwater River State Forest, Tate's Hell State Forest, Threatened species on November 17, 2013 by marylynanded.